If you have a large monitor and, moreover, he is hanging on the wall, in off hours it is very convenient to use as a beautiful and - most importantly - high-precision wall clocks. Table is also a good option. Downloading and installing the widget, you will get not just a beautiful watch, and with a surprise. As you approach the New year they will change. On 1 December, the clock will go countdown, two weeks before the festival they also get spruced up, and a week in General will turn into a Christmas toy. 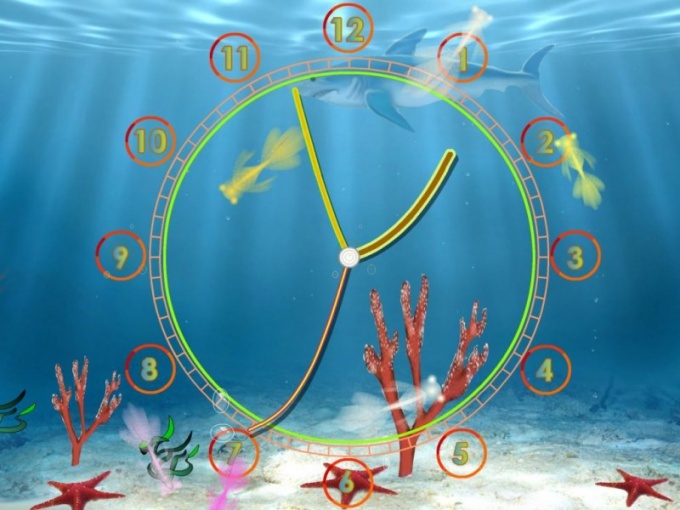 Go to this website: http://smaik1.narod.ru/glavn/stol_clock.html. There is a huge selection of different kinds of clocks for your desktop as a screensaver. Calendar, support alarm clock, custom time format for the taskbar can be changed to your liking. Just click on the line "download". Chronograph Atomic Time Clock v6.62. Another link to watch-chronograph. The computer clock is not always accurate. And it is sometimes, for example, for traders, is of great importance. Chronograph, periodically connecting to the server, automatically maintains the correct time. http://narod.ru/disk/20911809001/Clock_scr.rar.html. A set of 20 different options that you can change depending on mood. Click on the blue link and download 53.49 us MB. Unpack the archive to any folder prepared. Double-click on the picture, the watch appears on the screen. Copy any file and place it in the folder Sistem32 entered previously in My computer, then drive C and WINDOWS. To set the clockon an empty desktop, right-click and select the Properties line. This opens the customize desktop. Click on the tab "screen Saver", and in the list of options choose your own hours. Click OK.
Set the time after which the clock will appear on the screen when your computer is not active.